What are these, climbing turkeys? They're almost big enough. 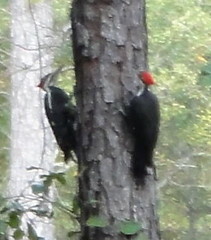 Or maybe a pair of Southern Pileated Woodpeckers (Dryocopus pileatus) on a longleaf pine (Pinus Palustris). Pileated Woodpeckers, Dryocopus pileatus, Lowndes County, Georgia. Pictures by John S. Quarterman, 7 November 2011.